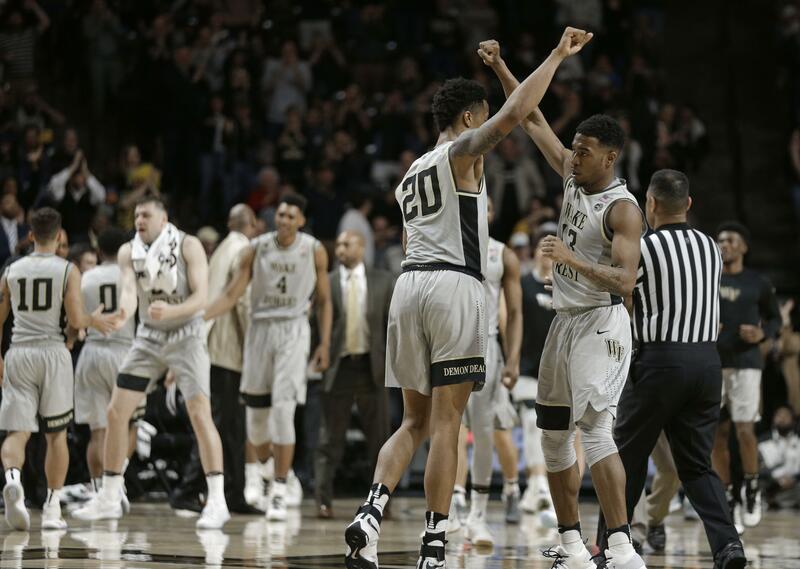 Keyshawn Woods added 20 points for the Demon Deacons (17-12, 8-9 Atlantic Coast Conference), who came into the game desperately needing a big win to bolster its NCAA Tournament resume. They got it, with Dinos Mitoglou and Mitchell Wilbekin hitting huge 3-pointers in the final 3 minutes to turn a 75-72 lead into a nine-point margin. Wake Forest is trying to reach the NCAA Tournament for the first time since 2010. Deng Adel scored 22 points for the Cardinals (23-7, 11-6), who got off to a fast start but shot just 39 percent after halftime. GAINESVILLE, Fla. (AP) – Canyon Barry scored 14 points, his best game since injuring an ankle two weeks ago, to lead Florida. Kasey Hill, KeVaughn Allen and Chris Chiozza added 12 points apiece for the Gators, who bounced back from their first loss in 10 games and clinched the No. 2 seed in the Southeastern Conference Tournament next week. Florida (24-6, 14-3) controlled the game much of the night, building a double-digit lead early, extending it to as many as 16 in the first half and then holding on after the break. Jaylen Barford led the Razorbacks (22-8, 11-6) with 18 points. Moses Kingsley added 17 points and nine rebounds for Arkansas, which had won five straight and 10 of 13. SOUTH BEND, Ind. (AP) – V.J. Beachem scored 22 points to lead Notre Dame to its sixth straight win. Bonzie Colson added 18 points and 11 rebounds for the Irish (23-7, 12-5 Atlantic Coast Conference), who have all but locked up a top-four finish in the ACC and a double-bye for next week’s conference tournament. Colson’s double-double was his ACC-best 18th of the season. Ky Bowman scored 19 points and Mo Jeffers had 12 points and 12 rebounds for Boston College (9-21, 2-15 ACC), which has lost 13 in a row and 15 of 16. Published: March 1, 2017, 10:53 p.m. Updated: March 1, 2017, 10:58 p.m.